Naming your blog is an as important decision as naming your child, as it is going to be represented to millions of people on the internet, even after your death. So naming a blog is extremely important for various reasons. Firstly, let’s uncover, why naming your blog site is so important. The first identity of your site to the readers will be the name of it. Irrespective of how good your contents are, or how marvellous pictures and videos you put out there, it will not work out, if you do not actually put on a good name of your blog site, which grabs the attention of your probable readers. If you were an entrepreneur and were about to create a company, the name would be playing a very important role. As that is Going to be the brand name you are going to create. In the same way, your blog is your brand, which you are establishing to the web. It has a separate entity, and it should be taken care of well. A name is the face of your blog, and the content will be the soul. Now nobody connects to the soul first, before knowing the name, in real life. So name plays a huge role along with the content of your blog. Now the question is how to get a great unique name for your blog which can win the hearts of people and stays there. Now before that, let’s talk about another important thing, which is how exactly your blog’s name should be. First chalk out, what is your blog all about. If your blog is about travelling, it will be making a lot of sense if you put some name related to travelling, if your blog is about food, it should include something related to food. Now imagine you come across a blog which has a name related to travelling, but actually dealing in foods, it will be upsetting that many people who are looking for food-related contents will miss that out, thinking it is a travel blog. In case you are wanting to put some funky names, make sure you at least somehow reflect your contents’ type in the name. Do you remember any name which was not easy to read from the internet? The answer is ‘No’, maximum of the time. Because psychologically whenever you will witness a strong name which you are having difficulty to pronounce, your brain will ignore it, immediately. So a lucid name to be remembered by everyone with the first read is extremely important if you want to be in the game for a longer time. Also make sure the name is short enough, for the same reason. Remember, you are creating a brand. So the name you are giving should be able to create the brand of your blog. It should be having the elements to be marketable. For example, the name is a major keyword for your blog page to rank in SEO. So make sure you use a good keyword, of course, related to your content, is in the name. If not, there is no such big harm, but it will only take more time to rank in the Search Engines. Now, let’s focus on, how to get the perfect name for your blog. 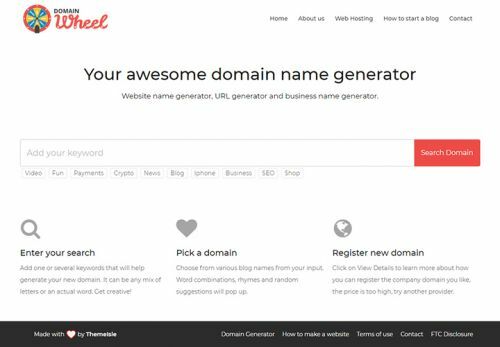 There are a bunch of Name generators for your blog, to get the perfect name within a few minutes just with a simple few clicks. These name generators will keep every factor in mind to enhance the chances of your Blog to grow beyond the limits. From the bunch of Blog Name generator for blogs, here the top notch 10 best name generators are talked about. 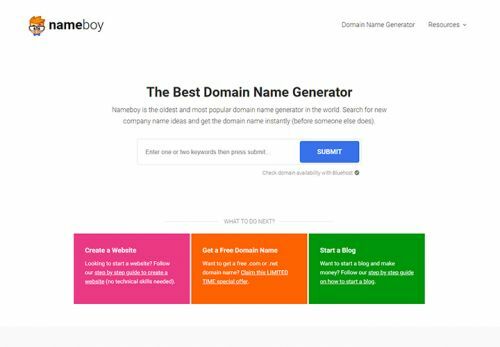 As the name says it all, NameBoy is a portal to name your blog, websites, and even your companies. It works on a simple trick, as you will need to require to put one primary keyword, mandatory, and another secondary keyword, optional. Now it will play around the two keywords, followed by other information of the blog site provided by you, and generate the best names possible one after the other, until you are satisfied. It is a fast and simple method to name your blog with ultimate uniqueness. It is one of the simplest tools you will ever come across on the web. It works with the same trick, taking two keywords from your WordPress blog, and merging them, adding different characters with them, spelling them backwards, spelling them in fun way, adding phrases, and much more. It will also help you to create your domain, as your choice. 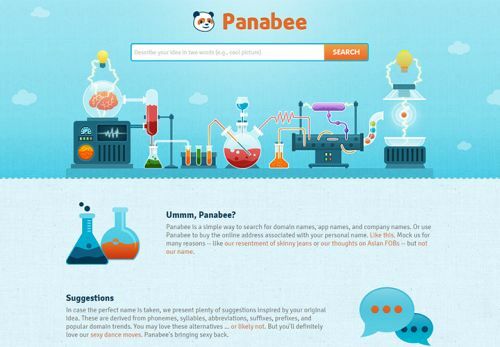 Be it org, in, com, or whatever you may like, as long as it is available in the GoDaddy portal, as Panabee is backed up by GoDaddy in case of registering the portal. If you want to have a smaller title that is under 15 characters, then this is the best option you can call for, for creating a blog name. It will use keywords and various languages to help you to come up with a short title without you having to do much work. It helps you if your content is about to break the international barriers, by giving such names which are merged of multilingual situations. 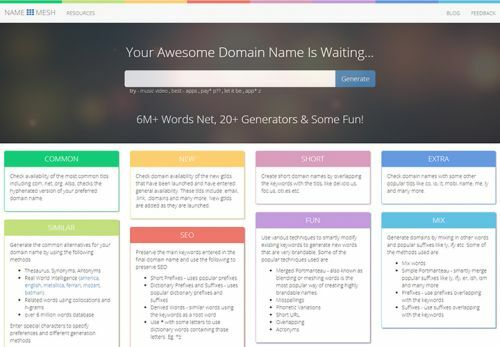 If you are unsure about the domain type, then this is another great tool that will help you. 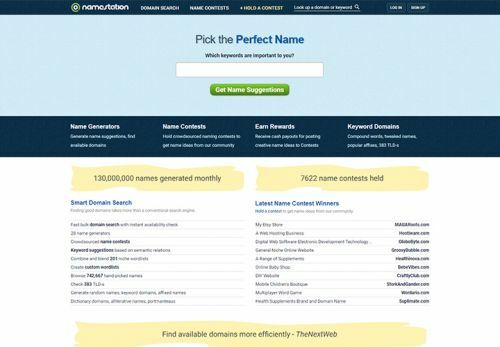 Not only will it help you to choose the right title for your site, but it can also help to suggest you, which type of domain is going to be best for your site. 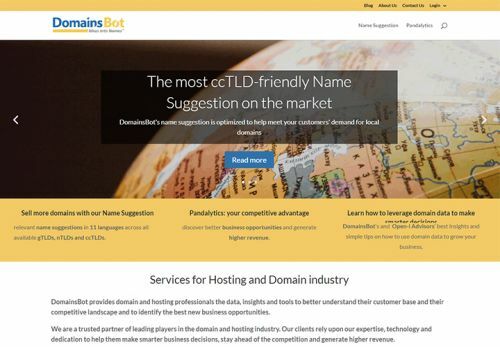 If the colour is green in highlight, the domain name is available, and if in red, it is not. The suggestions will be mixed in nature but all will be SEO focused. Creating a blog name is as easy as a few clicks now. This is another one of the top sites where you can find creative blog names and you would again simply need to plug in your keywords. Once this is done, then they would help you to find the right title for your needs, no matter what it might be. 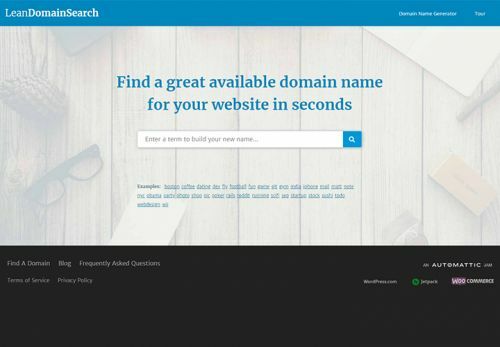 If you are searching for a title for your site that you can also use on other sites like Twitter, YouTube, Facebook and more, then this is the right option for you. You can include a wide variety of topics to help the site find the right title like the industry, numbers, keywords, niche and even a topic. For the people who already have a name in mind, then you can go to this site and see if it is already taken. You can also simply input the single word that you want to be included in the title and this can help you to find the right title for all of your needs. This is a simple tool that you can use and you can change up the synonyms that are options when it comes to your keywords. 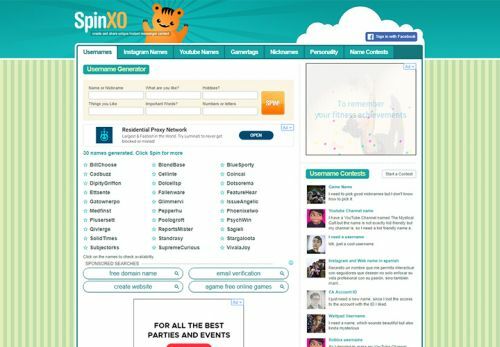 You can also pick and choose which of the various extensions you want to use along with the price range for the domain. When it comes to picking the title for your site, then this is the easiest option. You simply have to add your chosen keywords and then the wheel will start spinning and you can pick and choose one title from the many that would be given to you. If you ever worry about how to come up with a blog name, these options can ease your problems within a few clicks. Giving a creative blog name to your site is no more a big deal, anymore. Now, you are all set to launch your blog in a stylish and professional way where you can fetch the maximum amount of traffic, but always remember, content is the king. 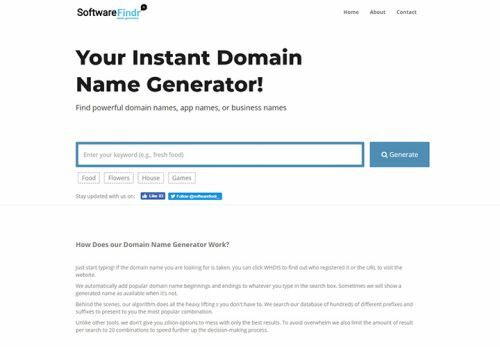 Softwarefindr instant domain name generator allows you to quickly brainstorm and find suitable names that are available for purchase. 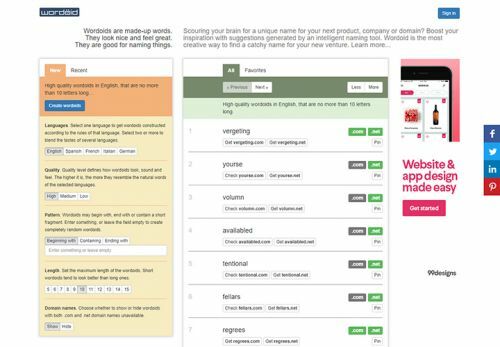 Softwarefindr quickly suggests the best combination and variety of keywords. The results are organized in an easy to read manner with the focus on consumption not to overwhelm users. If you ever worry about how to come up with a blog name, these options can ease your problems within a few clicks. Giving a creative blog name to your site is no more a big deal, anymore. Now, you are all set to launch your blog in a stylish and professional way where you can fetch the maximum amount of traffic, but always remember, content is the king. Mansi Rana – With over 13 years experience as a leader in digital marketing, Mansi Rana is Managing Director of EZ Rankings – Digital Marketing Company. Passionate about all things data; providing actionable business intelligence in digital, future tech; and venture bubbles categories for everyone, everywhere.